I needed this after the drive! After a harrowing 45 minute drive through rush hour (I don’t usually drive, but my chauffeur - the male human, was currently away on business in San Francisco), arriving late, and being randomly selected for additional screening at security, I was thankful to finally reach our first destination Chili's to sit down, relax and enjoy some company, conversation and hopefully some good food. Although I wished I was actually at the airport ready to jet off somewhere exotic, I was thankful it would be one less night I would have put up with the female humans’ “cooking". We were on night three of the male humans business trip, and since he’s the cook in our household, the drive was worth it to not have another night of microwave popcorn, ie. what the female human called “cooking”. I had only been to Chili's a few times at the Old Strathcona location before it closed, and can't say that I thought their food at the time was particularly memorable. However, I can say I will never forget the massive drinks they brought out to us! 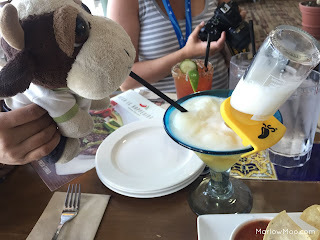 Their Texas Bulldog Margarita were crazy looking concoctions that I certainly wouldn't have thought to order on my own. A traditional lime margarita with a Coronita thrust upside down into the glass. It was surprisingly tasty. The Coronita doesn't gush out all at once but rather flows out as the glass empties, cutting down on the overly sweet flavour of this limey, slushy drink. White Spinach Queso - Addictive! Several rounds of appetizers, mind boggling in array and quantity were brought out including Wings Over Buffalo, Texas dry ribs (this item is only available in the EIA location in Edmonton), crispy onion rings, Southwestern egg rolls, and boneless buffalo wings. Although all of these appetizers were items one would normally categorize as bar food, the food quality was surprisingly high. I have to admit that I'm not really into your typical bar food, but I am a sucker for good chicken wings. These wings were expertly cooked, with a super crispy exterior while maintaining the moist and juicy chicken meat inside. Tasty on their own but were even better when paired with the mildly sweet mango salsa or their sweet chili sauce, which had a slow, creeping heat. Knowing that there was more food in my future, I resisted the urge to eat more than two wings. Little did I know that my favourite dish at Chili's was yet to come. Their white spinach queso was made with white queso, chopped spinach, Monterey Jack cheese, house made pico de gallo, fresh guacamole, queso fresco and chopped cilantro. This warm, cheesy, gooey concoction was not only tasty but incredibly satisfying and comforting, something I could foresee eating on a cold winters day or as a guilty pleasure on a bad day. The mix of savoury, melted cheese, bright pico de gallo and refreshing guacamole came together in one dangerously, addictive mouthful. We moved onto Heineken Lounge for our main course, which although focuses on the Heineken beer brand, also offers a variety of other beers, cocktails, liquors and wines, not to mention a selection of food. If you're into Heineken beer, you should know that the only Heineken Lounge in Canada in located at EIA. Considering how much we ate at Chili’s, I wasn’t feeling like a massive entree, which they seemed to have quite a few of. So instead I opted to try the Satay Chicken, which was probably the weakest dish of the night. Although it had an adequate balance of spicy peanut sauce, the chicken was somewhat on the dry side and the quality of the dish paled in comparison to the food quality that had been presented to us previously at Chili's. Thankfully, there was still dessert to look forward to, and after a brief visit to the living wall for a photo op, we found our way to Caffe Sorrentino Italian Coffee Bar. 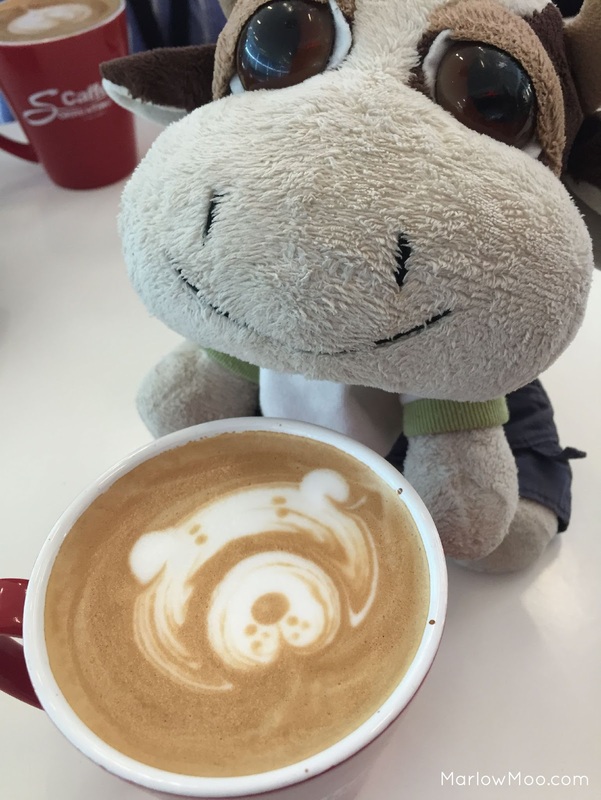 Although I've walked by many Caffe Sorrentino Italian Coffee Bars in Edmonton, I've never bothered stopping in, considering the vast number of choices we have in Edmonton for coffee shops. 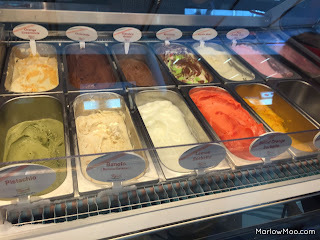 With a plethora of coffee and Italian desserts before us, including gelati, I knew that I likely wouldn't be walking by one again without at least a glance inside at that day's dessert offerings. I was delighted to be presented with a latte with a bear, expertly created with the interplay between foam and espresso, and even more so upon my first sip finding a perfectly balanced latte, requiring no additional sugar and no hint of bitterness I often find with unflavoured lattes in Edmonton. Their chocolate gelato was satisfyingly rich without being overly sweet and I only wished I wasn't ready to burst at the seams as I tried desperately to eat every last morsel. Overall, it turns out that restaurants at EIA had a lot more to offer than I gave them credit for. I look forward to eating more white spinach queso at Chili's and eating my way through the numerous desserts Caffe Sorrentino Italian Coffee Bar has to offer the next time I'm at EIA waiting for a flight.